Under sponsorship of the BICAA, the Baroque on Beaver Festival will have more concerts, an expanded Summer Music Camp, and some surprise musical events around the island! In 2002 when regular island visitor, Chas Kurtz, Prof. Emeritus of Concordia University, Seward, NE brought both the music and the “persona” of J.S. Bach to Beaver Island, he was joined by some 30 musicians who performed to an overflow crowd at the log cabin chapel – St. James Episcopal Mission. Over the last four years that single concert has evolved into an exciting four day festival. 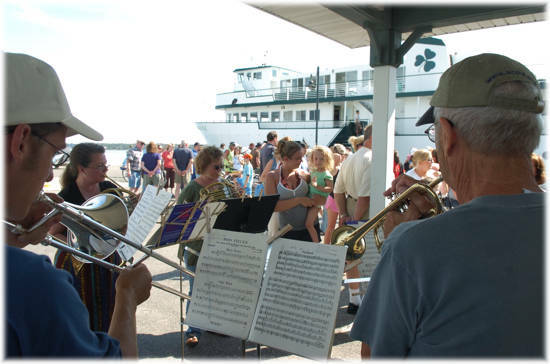 This year, approximately 80 professional, student, and amateur musicians from Beaver Island, mainland Michigan, and eight other states joined in the celebration.